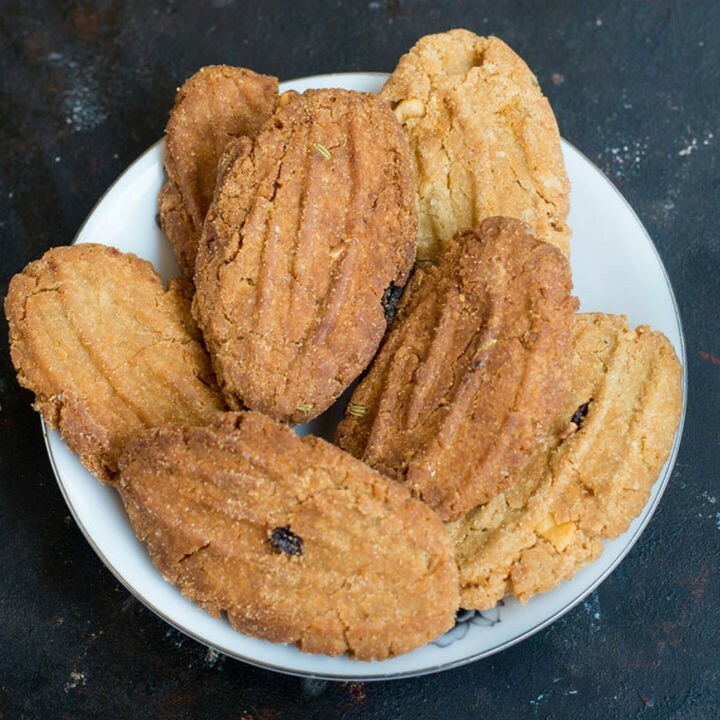 Thekua or Thekariis is a biscuit like sweet made across regions of Bihar, UP, Madhya Pradesh and West Bengal. It is also known as Khajuria in many other parts of the country. For centuries, this style of Indian biscuit has been a favourite and usually consumed along with tea. Crispy, crunchy and sweet, it is usually made as prasad during the month of Chhath. Traditionally made with flour and jaggery/gud and the quintessential Ghee, Thekua though high in calories is delicious and travel friendly. The best part of this local biscuit is that it stays good for days without any preservatives. Initially soft after frying, it hardens and becomes crunchy after it cools down. This can be a great snack for kids as well and easy to whip it up as the ingredients are readily available in our own pantries. The trick to making Thekua is in the dough consistency. It has to be slightly hard and shouldn’t be allowed to soften. Softening reduces crispiness and makes it poori like. A few other spices like saunf is also added to enhance Thekua’s flavour and aroma. If you want to avoid using too much jaggery or sugar, you can add dry fruits like khajur (dates) or kismis (raisins) or black currents. In our recipe here, we have used Jaggery and whole wheat flour to bring in some extra goodness. If you don’t have jaggery, feel free to use regular sugar. So, try out our Thekua recipe and let us know your experience. 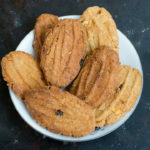 Thekua or Thekariis is a biscuit like sweet made across regions of Bihar, UP, Madhya Pradesh and West Bengal. Take a deep, heavy bottomed vessel and heat the water. Put in the sugar or Jaggery into it to make syrup. Keep stirring occasionally. The syrup should be slightly thick. Remove from flame and strain (if using jaggery). Take another wide vessel to mix the dry ingredients. Add the syrup and ghee in intervals and knead into a slightly hard dough. Don’t make it too soft, or it will become poori. Cover and keep it aside for 10 minutes. Heat a kadai with oil under medium flame. Make small ball shapes and gently press them into flat discs. Use a fork to make indents or a mould to make designs on them. Fry one by one in oil. Make sure the the flame is kept in medium to low level, so that it will get cooked evenly. Remove from flame when it turns golden brown. When it cools down, transfer to an air tight container and store it. In our recipe here, we have used Jaggery and whole wheat flour to bring in some extra goodness. If you don’t have jaggery, feel free to use regular sugar. Feel free to comment or share your thoughts on this Thekua Recipe from Awesome Cuisine.